Janelle was born and raised in Southern California. She received her juris doctor degree from the University of St. Thomas School of Law with honors. 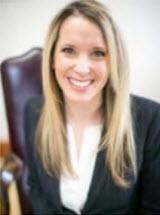 During her time in law school, Janelle served as senior editor of the St. Thomas Journal of Law and Public Policy, worked as a student attorney in the Nonprofit Organizations and Elder Law clinics, and volunteered extensively with the Minnesota State Bar Foundation and Wills for Heroes. She currently lives in Eden Prairie with her husband and their five children. In her free time Janelle enjoys creative writing, supporting Minnesota hockey, and spending time outdoors with her family.